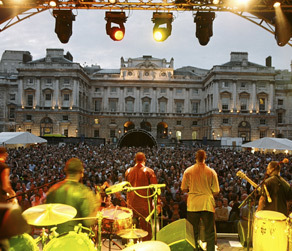 When it comes to watching gigs in the warm balmy evenings of summer, you can’t get much better than a night of live music at Somerset House. Opening their doors for the annual Summer Series next month, this year’s line up won’t fail to provide you with a night to get excited about. 80’s icon and androgyny’s poster girl Grace Jones will kick the season of in style like no other. Reports from gigs around the globe indicate this isn’t a night to be missed with a live show that includes catsuits and hula-hoops, no mean feat at 61! The ever expanding genre crossing Australian band/DJ outfit Pendulum will be tearing up the stage with their thrashy AC-DC inspired hybrid sounds. Is it drum and bass? Is it metal? Who knows? Who cares when it sounds this good. Don’t get too crazy though, unfortunately it’s on a school night! Plus hot off the back of their 9th studio album release Welsh psychedelic rock gods Super Furry Animals will be keeping the sun shining on the season's penultimate night. These guys have been refining and experimenting with their sound since the mid 90’s and never fail to deliver a memorable night. Other highlights include The Enemy, Calvin Harris and Lily Allen who we are sure will sound amazing in the London sunshine. For information on the other acts and ticket info visit the Somerset House Site and be quick, because these nights will sell out fast!